It has been an amazing year for Way Library. And much of it was made possible because of private gifts to the Way Public Library Foundation & Friends. Donations were the primary funding source for many of the 700+ programs we provided for youth, tweens, teens, and our young, middle-aged, and older adults. Without the support of our donors, many of these programs would not have been possible. Way is constantly reevaluating the needs of our community. Thanks to the vision and passion of our tremendous volunteers, our great staff and of our highly committed donors we eagerly look forward to exciting things in 2019. Thank you for your continued generosity. Your tax-deductible donation is not only an investment in Way but in all we strive to provide for our great community. Looking for great reads at amazing prices? Due to our ever-enlarging inventory, we now have an ongoing book sale on the library’s lower level. You can buy books during library open hours at dramatically reduced prices. Inventory consists of thousands of books including fiction (hardcover and paperback), children’s books, inspirational, religious, cookbooks, and large print. In addition, we have recently added a large selection of DVDs, Blu-rays and Music CDs. While you are here, don’t forget to check out our “Specials” racks in the main lobby. These “like new” hot titles are available every day at prices that can’t be beat. New titles added daily. Way Library is pleased to announce the release of the book, Now Hear This! 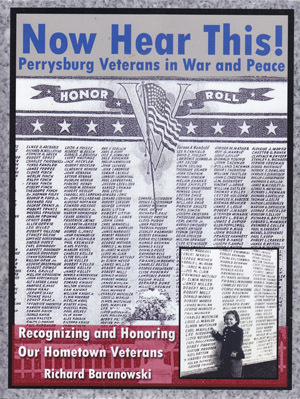 Perrysburg Veterans in War and Peace. It was written by Local History Librarian, Richard Baranowski. The book contains 71 stories of local veterans talking about their life in the service. The book was largely transcribed from personal interviews over the past 15 years, including many who fought in WWII. Now Hear This! also contains more than 200 wonderful photographs of our local veterans. Another fine history book for Perrysburg! Put it on your Christmas list! You can now order the book for $27.00 plus $5.00 for shipping (total: $32.00). Alternatively, you can purchase the book at the Way Public Library Information Desk. Making a bequest to the Way Public Library Foundation & Friends not only is a sign of benevolence, but also is the mark of your desire to help shape the future. The proceeds of any planned gift can be unrestricted, allowing the Foundation to meet the needs of the Way Public Library as they arise, or can be restricted, offering a way for you to support a program or area in which you are particularly interested. Kroger Rewards - Time to Register or Re-Register! Donating is easy and your gift means more now than ever. A strong public library is the foundation upon which a community can preserve the past, empower lives today, and build for the future. to act as advocates to ensure that library services continue on into the future. Whether donating online, through the mail or in person, you can always specify where you would like your donation to be put to best use. For additional information, please contact Lisa Richard, Foundation & Friends Administrator, at 419.874.3135, ext. 139 or email at lisa.richard@waylibrary.info.